November 9, 2018, Providence – The Rhode Island Coastal Resources Management Council (CRMC) along with its partners has been awarded grant funding from the National Fish and Wildlife Foundation to continue work to make Rhode Island’s shoreline and coastal habitats more resilient in the face of rising seas and increased storm events. Van Zandt Avenue. Eroded pavement is removed from the road’s end. The announcement of the $280,140 Rhode Island Shoreline Adaptation for Resilience and Habitat Enhancement grant was made today at the Save The Bay headquarters in Providence. With the funds, the CRMC and project partners Save The Bay, the University of Rhode Island’s Coastal Resources Center and Rhode Island Sea Grant, and Roger Williams University Marine Affairs Institute will identify 10 sites within the boundaries of the CRMC’s R.I. Shoreline Change (Beach) Special Area Management Plan – which covers the state’s 21 coastal communities – that would benefit from shoreline adaptation. The team will work with municipalities and local groups to plan, design, and permit these projects to bring them to “shovel-ready” status. The projects, along with others identified during the planning process will be mapped on a publicly accessible, web-based platform in order to create a comprehensive inventory for future implementation. Roger Williams University will provide legal research and guidance for municipalities related to future project execution. Warwick’s City Park. 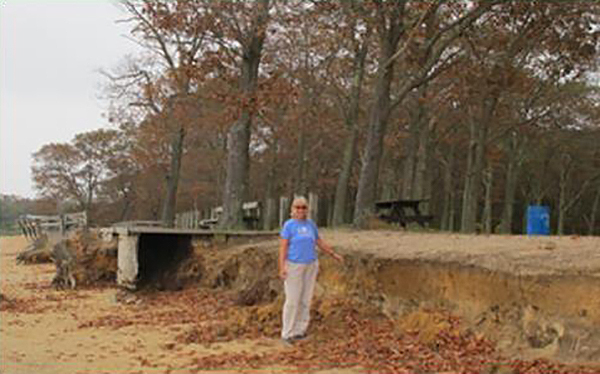 CRMC’s Janet Freedman stands at the eroded bank. The CRMC and its partners have worked specifically on addressing these threats over the last decade. From 2009 to 2014, the CRMC worked with Save The Bay to develop guidance for non-structural shoreline protection and recommendations for shoreline adaptation policy development. As part of this effort, 13 pilot projects were constructed and three more designed in Barrington, Cranston, Newport, Warren, and Warwick. For each of these projects, the representing community was engaged in all aspects of the process, and completed projects are highlighted in a story map developed by URI CRC - https://uri.maps.arcgis.com/apps/Shortlist/index.html?appid=cbd9d6ae7a9d40b0b648432e95e66aec. 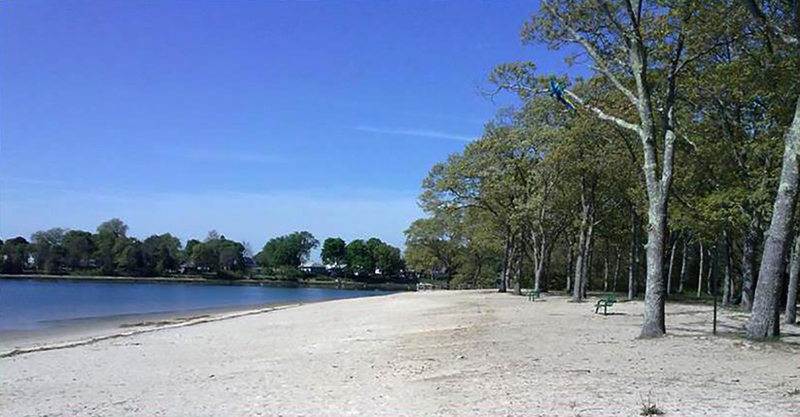 URI CRC and Sea Grant developed a Coastal Green and Resilient Infrastructure Project (GRIP) that identified opportunities and obstacles to using green infrastructure as a coastal resilience tool in Newport, North Kingstown, and Warwick. The CRMC was part of the project team that included members from the RI Nursery and Landscape Association, municipal representatives, and the University of New Hampshire Stormwater Center. The CRMC in partnership with the URI CRC and Rhode Island chapter of The Nature Conservancy also developed Sea Level Affecting Marshes Model (SLAMM) maps for the 21 communities’ coastal wetlands, to show how they will likely transition and migrate onto upland areas under projected sea level rise rates of 1, 3, and 5 feet in the coming decades. The maps are intended to assist state and local planning efforts in adapting to future coastal wetland conditions despite the uncertainties associated with future sea level rise rates. Warwick’s City Park. The newly re-graded shoreline. 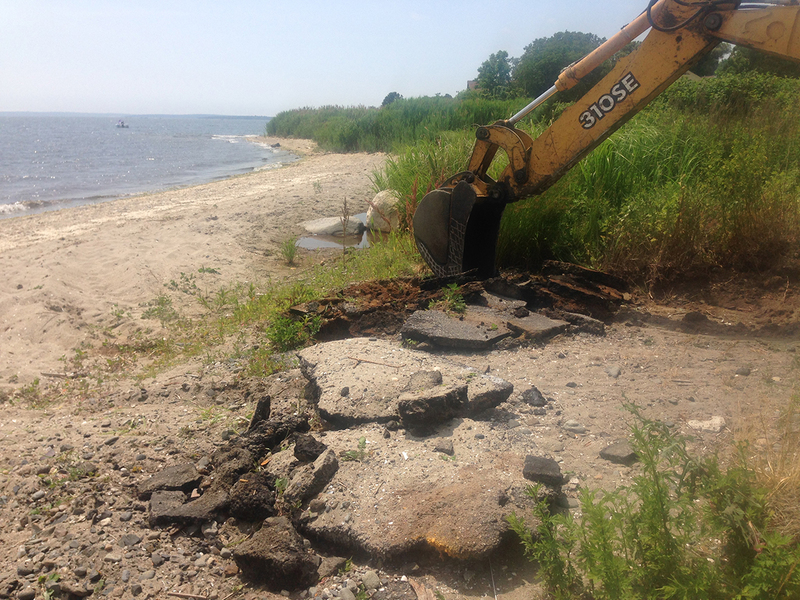 On June 12, 2018, the CRMC adopted the Shoreline Change (Beach) SAMP, a comprehensive policy that provides guidance and tools for state and municipal decision-makers to plan for, adapt to, and recover from coastal storm, erosion, and sea level rise impacts. In addition to the policy document – which contains a unique coastal permitting process – the SAMP includes a suite of web-based tools (STORMTOOLS) that provides maps of sea level rise and storm surge models, updated shoreline change maps for the entire coast, a Coastal Property Guide for residential and commercial property owners, and an app (MyCoast Rhode Island) for real-time citizen reporting of flood and storm events and impacts. U.S. Senator Sheldon Whitehouse (D-RI) attended the event, along with Congressman David Cicilline (D-RI). Earlier this year, Whitehouse and U.S. Senator John Kennedy (R-LA) worked together to establish the initial round of funding for the newly created National Coastal Resilience Fund, through which these 35 grants were awarded to 22 states and Puerto Rico. This round of grants representing a total of $28.9 million in new projects for the restoration or expansion of natural features that help minimize the impacts of storms, sea level rise, and other extreme events.